This is completely self-serving, BUT it is coming from a place of sharing. I just grabbed +James Mishler's newest product Ghosts -- The Incorporeal Undead. If you want to get an idea of what you can do with his new book check out his blog at http://jamesmishlergames.blogspot.com/. In particular The Pesky Poltergeist, The Ghost of the Haunted Keep and the Friendly Ghost. Check them out if you recognize them! To make the claim that this book "Plays Well With Others" is actually weak on my part. Weak because the book is really designed to "Play Well With Everyone". It is Labyrinth Lord compatible (says so on the cover!) but beyond that it is really compatible with just about anything I can think of. In particular I was thinking how well this would work with Castles & Crusades, or even one of my favorites Astonishing Swordsmen & Sorcerers of Hyperborea and D&D5. His book is written in some sort of Ur-D&D that pretty much works with anything. So my claims really are not really needed. But I want to make them anyway. What I am really excited about is how well it works with my own witch book (that's the self-serving part), but I am excited all the same. Witches and Ghosts have always had a nice relationship. Within James' book there is the "Ghost Net" which is mentioned as being created by witches (well and by others too). According to rules in The Witch a Ghost Net is created as a Talisman. It can be hung over the threshhold of a doorway to keep ghosts away. Usually a Protection from Evil or Ghost Ward spell is all that is needed. From my book here some spells that would work well with James' Ghost book. Either for or against ghosts. If you are using James' Hercynian Grimoire #1 then these are Charisma based-spell casters. So what is the intersection of these two books? Well that is easy! 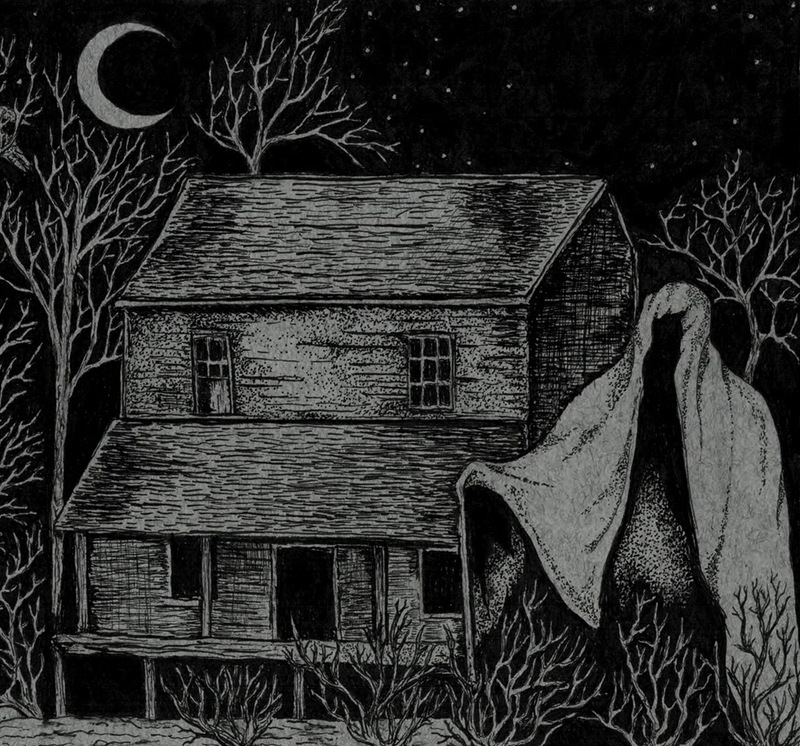 The Bell Witch. The legend of the Bell Witch has been a part of American folklore since the 19th century. You can read more about the Bell Witch here, http://www.bellwitch.org/ and here http://www.bellwitchcave.com/. For your game here are the pertinent details. Katie Batts was an old witch that died on the Bell Farm sometime in the early 1800s. She haunts the farm and in particular Betsy Bell to gain her revenge on John Bell, whom she believes is responsible for her death. Katie Batts was a 3rd level witch in life. She had a small dog as her familiar who died when she did. Treasure: The Bell Witch has no treasure. Ghost Witch: The Bell Witch was a witch when she was alive. She can still cast spells as a 3rd level witch. This is the same as Ghost Magician ability. Poltergeist: The Bell Witch is a type of powerful Poltergeist. She can manipulate up to 150 lbs at a time. Bell Witch Ectoplasm: This ectoplasm will allow the imbiber to use witch witch spells of up to the 2nd level. The imbiber must make percentile roll against the total number of ounces imbiber has had their entire lifetime. Rolling under this amount results in the loss of 1 life level (or Constitution point).